Dale Staples (St Francis Bay) placed equal ninth in the Quiksilver Saquarema Prime presented by Coca-Cola which was won by Mitchel Coleborn (AUS) at Itauna Beach in Saquarema, Brazil yesterday (Sunday). In waves that ranged from near perfect two metres to unruly three metres plus during the 96-man Prime rated US $250 000 (approx. 2.3 million) event, Staples advanced to the last 16 before being ousted by Aritz Aranburu (EUK). The 22 year-old earned $4 300 and 2 400 points that saw him vault 28 places up the 2013 ASP World Rankings to No. 40. Recently crowned ISA World Champion Shaun Joubert (formerly Mossel Bay but now also residing in California) advanced to the Round of 48, defeating eventual winner Mitch Coleborn in the process, but finished equal 25th overall. Joubert pocketed $1900 and 700 points, moving up 21 places to No. 85 in the latest rankings. Durbanite Travis Logie, now living in Hollywood, California, and Beyrick de Vries (Umhlanga) were first round casualties at Saquarema. Coleborn, 26, clinched his career first ASP victory by defeating Marc Lacomare (FRA), 22, by a score of 17.60 to 15.67 in the final on Sunday, earning $40,000 in prize money and 6,500 points that catapulted him up to No. 14 on the ASP World Ranking. 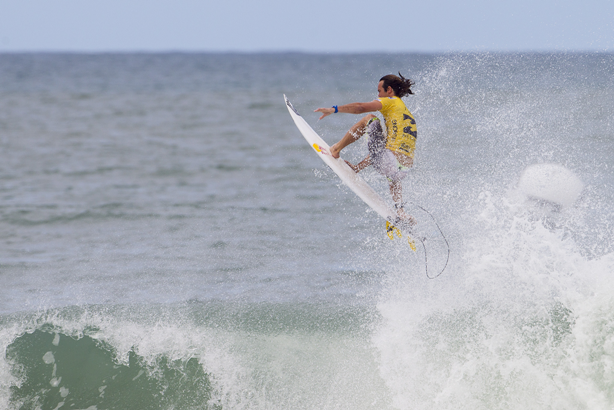 The next stop on the ASP Prime Series is the Mr Price Pro Ballito in Ballito from July 1-7. The next stop on the 2013 ASP World Championship Tour (WCT) will be the Volcom Fiji Pro from June 2-14. South African surfer, Jordy Smith, 25, has won the Billabong Rio Pro in a hard-fought final over local favourite Adriano de Souza (BRA), 26, in clean one to 1.5 metre waves at Barra Da Tijuca in Rio de Janeiro, Brazil. Smith used his superior variety of technical airs and powerful turns to defeat de Souza, posting the highest scoring ride of the final for a massive front-side aerial that earned 9.30 points out of a possible 10. His second scoring wave included an impressive stale fish air-reverse that was awarded 8.50 points. De Souza had the huge local crowd on his side, taking an early lead and fighting hard throughout the 35 minute final but ultimately finished runner-up with a 16.34 total to Smith’s 17.80 points. Smith’s third WCT career victory, and his first outside South Africa, earned the lanky Durbanite US$100,000 (approx. R900 000) and 10,000 invaluable world title ratings points that saw him jump five places to number two on the ASP World Championship Tour (WCT) rankings. Smith’s surfing on the final day was nothing short of amazing as he defeated dangerous rookie Filipe Toledo (BRA), 18, in their quarter-final encounter and then two-time ASP World Champion Mick Fanning (AUS), 31, in the semis. Smith attributed today’s success to his ability to adapt his strategy to both his competitors and the ever-changing conditions of Barra Da Tijuca. De Souza, the 2011 Billabong Rio Pro winner, went on a rampage to advance to his second career final in Rio, eliminating 11-time ASP World Champion Kelly Slater (USA), 41, in the quarters and goofy-footer Gabriel Medina (BRA), 19, in the semis, but was unable to top Smith’s devastating form in the Final. De Souza’s win in the last event at Bells Beach combined with his runner-up effort today vaults the hard-working Brazilian to the No.1 position in the rankings, boosting his chances to be the first-ever Brazilian ASP World Champion. Gabriel Medina (BRA), 19, was incredible on the final day of competition, earning a perfect 10-point score for a lengthy barrel-to-air combination in his quarter-final victory over Adrian Buchan (AUS). The high-flying Brazilian was equally dangerous against de Souza with an excellent 17.50 out of 20 heat total, but fell just short of the final despite a valiant last-second effort, finishing equal 3rd. Kelly Slater (USA), 41, 11-time ASP World Champion and the 2013 rankings leader coming into the event, was near-flawless in yesterday’s action but was out of rhythm in the opening quarter-final of the morning against De Souza, finishing 5th in the Billabong Pro Rio and slipping to No. 4 in the rankings. The next stop on the 2013 ASP World Championship Tour (WCT) will be the Volcom Fiji Pro from June 2 – 14, 2013. 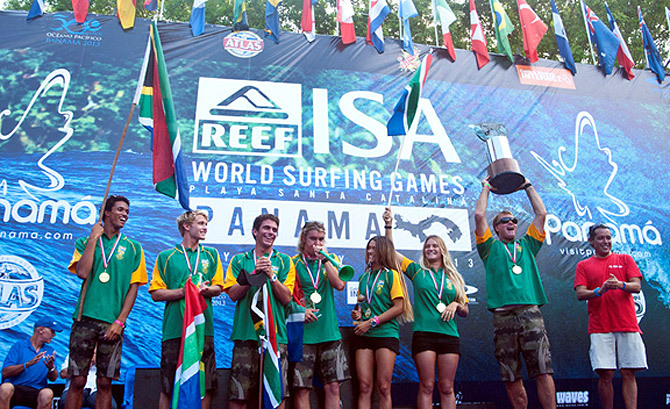 The South African surfing team celebrated a famous double at the 2013 Reef ISA World Surfing Games in Panama yesterday when they were crowned the ISA World Team Champions and captain Shaun Joubert clinched the ISA Men’s World Champion title. Team SA fought a see-saw battle for the most prestigious team title in world surfing, leading the standings on Days 5 and 6 before slumping to fourth place going into the final day when Joubert’s outstanding victory saw them overtake perennial rivals and defending champions Australia, emerging surfing powerhouse Peru and Brazil who earned silver, bronze and copper medals respectively. In addition to the gold medals, the team collected the Fernando Aguerre World Team Champion Trophy, the International Olympic Committee (IOC) President’s Trophy and the once-off 5th Century Cup of the Discovery of the Pacific Ocean for winning the title for the first time outside South Africa and third time overall, after their triumphs in Durban in 2001 and in East London in 1978. Joubert, who was the oldest member of the SA squad after turning 22 earlier this month, led his team victory by dominating the Men’s division from start to finish, advancing directly to the Grand Final by never finishing outside the top two in any of his seven heats, posting four of the top eight single ride scores, including the highest (9.87 out of 10), and three of the top six heat tallies. After demolishing his opponents on the last day, leaving them needing a combination of two rides totalling 17.50 points as he advanced to the last four, Joubert then topped that in the final by racking up rides of 9.33 and 8.33 for a 17.66 point total. The current ASP No. 104 and multiple SA age-group champion used a canny combination of excellent wave selection, superior heat management and long rides punctuated by explosive manoeuvres, with his variety of carves, cutbacks, vertical re-entries and aerials setting him apart from the rest. In an interview shortly after the final, Joubert also explained how he had felt in tune with the waves at Santa Catalina in Panama ever since the team’s arrival a couple of days before the event started, comparing them to the similar right point breaks found around his home town of Mossel Bay. He also expressed his appreciation for the support of his teammates and how comfortable the entire team had been at the event which is a tribute to manager and coach Etienne Venter who motivated the team with an average age of just 20 to beat the world’s best. While Joubert’s crown was the cherry on the top and contributed significantly to the team title, the performances of every team member was vital. Mikey February, fellow Kommetjie surfer Davey Brand, David van Zyl (Glenashley), Tanika Hoffman (Clifton) and Faye Zoetmulder (Cape St Francis) all finished in the top 16 in their respective divisions as Team SA triumphed over the other 23 national teams and 120 surfers at the event. For the record, Jean Carlos “Oli” Gonzalez (PAN) produced a fairytale result for the host nation when he became the first Panamanian surfer to earn a medal at the ISA World Surfing Games, finishing second and the only surfer capable of overtaking Joubert with one ride. Former ISA World Junior Champion, Cristobol de Col (PER), took the Men’s bronze medal and Russell Molony (AUS) the copper. Australia dominated the Women’s event where Dimity Stoyle took gold, teammate Codie Klein the silver with the bronze going to Suelen Naraisa (BRA) and the copper to Ella Williams (NZL). The 2013 South African surfing team has been provided with kit by RVCA. The top 7 placed teams qualified for the ISA China Cup, the ISA’s signature event, that is held annually in January on Hainan Island in the South China Sea, where South Africa will be the top seeds in 2014.. The South Africa surfing team’s hopes of both a team and an individual medal at the 2013 Reef ISA World Surfing Games rest squarely on the shoulders of captain Shaun Joubert as the ‘Olympics of Surfing’ heads into the final day at Santa Catalina in Panama today (Sunday). Joubert was the shining light for Team SA yesterday, posting the highest heat total in Men’s qualifying Round 5 to move within one heat of the Grand Final and a gold, silver, bronze or copper medal with a stellar display of high performance surfing in the crumbly 0.5 to one metre waves. The rest of the team fought courageously until the end of every heat they contested to earn as many points towards the team total as possible before bowing out. Kommetjie teammates Mikey February and Davey Brand finished equal 13th overall contributing 1 800 points each while David Van Zyl (Glenashley) ended his campaign in equal 16th place with a haul of 1 652 points. Tanika Hoffman (Clifton), who produced several of the highest heat totals in the Women’s division during the event, had her charge halted in repercharge Round 5, placing equal 11th and earning 950 points, with Faye Zoetmulder (Cape St Francis) eliminated one round earlier in equal 13th place which added 900 points to the team tally. With only one team member still in contention, Team SA slipped to fourth place overall in the provisional team standings behind Brazil, who have four (two men and two women), defending team champions Australia with one man and two women and Peru with one man and one woman heading into the final day. The valuable contributions by the five South Africans eliminated in yesterday’s action leave Team SA over 1 500 points ahead of fifth placed Costa Rica who, along with Argentina, Chile, hosts Panama and Italy, all still have one team member chasing a medal. Surfline, the official surf forecasters for the Reef ISA World Surfing Games, predict better surf for the final day with chest to head-high and occasional overhead waves, growing larger during the day, and light offshore winds in the morning, becoming onshore later. The final day of the 2013 Reef ISA World Surfing Games starts with The Morning Show at 6:20am (1.20pm SA time) followed by the surfing action when conditions are suitable. South Africa’s Bianca Buitendag achieved the best result of her fledgling professional surfing career when she placed third in the Colgate Plax Girls Rio Pro, stop No. 5 of 7 on the 2013 ASP World Championship Tour (WCT), at Barra da Tijuca beach in Rio de Janeiro on Saturday. The 19 year-old rookie from George in the Southern Cape, competing in just her fifth event at this level, overcame a string of the world’s best female surfers to reach the semi-finals before bowing out to eventual event winner, Tyler Wright (AUS), 19. Buitendag won US $8 000 (approx. R72 000) and an invaluable 6 600 points that saw her move up one place to eighth on the ASP Women’s WCT leaderboard. With two events left in the 2013 season she is now a significant 3 550 points ahead of Malia Manuel in the 10th and final spot for automatic requalification for next year’s elite WCT. Buitendag started her Rio campaign with a third place finish in Round 1 before bouncing back to defeat Philippa Anderson (AUS) in Round 2. After repeating her third place in Round 3, the South Africa overcame the challenge of ASP No. 13 Pauline Ado (FRA) before holding on to defeat the third seed, Courtney Conlogue (USA), in their quarter-final match-up. Wright dominated the Barra da Tijuca line-up from start to finish, posting the high scores of each round with progressive combinations including the final where she unloaded committed forehand combinations and was rewarded a 9.33 and 8.50 to secure the win. Wright’s victory in Rio marks her second of the season following a win on the Gold Coast and the two victories combined with two additional runner-up finishes have launched Wright to the No.1 position over Carissa Moore (HAW), 20. Sally Fitzgibbons, defending event champion, put in an amazing effort in an attempt to retain the Colgate Plax Girls Rio Pro Title, ousting Oahu’s Carissa Moore in their semi-final bout, but was unable to put a stop to Wright’s momentum in the final to finish runner-up overall. Event organizers will reconvene this morning at 7:30am local time (12.30pm SA time) for a possible start to Round 2 of Billabong Rio Pro Men’s competition. When men’s competition resumes, South Africa’s Travis Logie will contest Heat No. 10 against fellow ASP WCT veteran Kieren Perrow (AUS). Jordy Smith advanced directly to Round 3 after winning his opening encounter in Rio last Thursday. South Africa retains the lead in the provisional rankings for the team title as they head into the penultimate day of the 2013 Reef ISA World Surfing Games in Panama with all four members in action yesterday progressing to the next round in their respective divisions. A revised schedule due to a late start caused by onshore winds, small waves and a low tide saw only two rounds of repercharge heats run with Tanika Hoffman and Faye Zoetmulder securing first and second places in their Round 3 heat while Mikey February and David van Zyl both won their Round 5 encounters. Hoffman was the standout of the Women’s competition, racking up a heat total of 15.27 out of 20 with rides of 8.0 and 7.27 to finish 2.54 points ahead of Zoetmulder as the pair eliminated Pamela Verboonen (Mexico) and Malena Toral (Panama) from the event. February was just as dominant in his clash, earning scores of 8.17 and 7.0 as he left Russell Molony (Australia) needed a near perfect 9.0 for the heat victory. David van Zyl ground out a narrow win over Brazilian standout Ruda Carvalho with a pair of five point rides in the tricky surf and the pair eliminated Gilbert Brown (Costa Rica) which helped to extend SA’s lead in the team standings. With all six team members still in contention, Team SA now has a significant lead ahead of second placed Brazil who had one of the four men eliminated early in the event. Defending champions Australia, with two men eliminated, have overtaken Peru and Costa Rica to move into third place. The team accumulating the highest points total wins gold medals along with the Fernando Aguerre World Team Champion Trophy, the International Olympic Committee (IOC) President’s Trophy and the “Copa V Centenario Del Descubrimiento Del Oceano Pacifico,” or 5th Century Cup of the Discovery of the Pacific Ocean. The top seven nations also qualify to compete in the ISA China Cup, the ISA’s signature event that is held annually in January on Hainan Island in the South China Sea. The event got underway at 2pm SA time today with Shaun Joubert advancing to the last six in the Men’s qualifying stream when he finished second behind Cristobol de Col (Peru) in a low-scoring clash in the tiny waves. Davey Brand finished third in his qualifying Round 4 heat and joins teammate David van Zyl in Heat 1 of repercharge Round 6 where they will be hoping to oust their opponents from Costa Rica and Australia. The South African surfing team leads in the provisional standings heading into Day 6 of the 2013 Reef ISA World Surfing Games in Panama and is now the only country with all six team members still in contention for medals at the event known as the ‘Olympics of Surfing’. After a full day of action in inconsistent waist to chest high waves yesterday, team captain Shaun Joubert and Kommetjie’s Davey Brand posted hard fought second place finishes in the their Round 3 heats to remain in the Men’s qualifying stream. Tanika Hoffman and Faye Zoetmulder won their Women’s repercharge Round 2 heats and will be up against each other Round 3. Mikey February and David van Zyl, who dropped into the repercharge rounds after placing third and fourth respectively in their Round 3 heats, both then safely progressed to Men’s repercharge Round 5. Van Zyl, who occupied fourth spot at one stage in his repercharge heat, kept active and eventually earned a 3.17 that moved him into second place ahead of Gabriel Villaran, who was the first Peruvian to be eliminated from the event, giving Team SA sole possession of the rankings lead. Hoffman earned a produced a couple of five point rides to eke out a narrow heat victory over Nao Omura (Japan) with a heat tally of 11.53, the highest women’s total of the day. Small waves and extreme tides continue to delay the start of each day’s competition at Santa Catalina. Today’s action is scheduled to get underway at 12noon (7pm SA time), conditions permitting, and all six SA team members will be competing. All the action can be followed live via webcast at www.isawsg.com Today’s webcast begins with the Morning Show at 6.10pm (SA time) followed by competition starting when the conditions are suitable. Jordy Smith was on fire on the opening day of the Billabong Pro Rio yesterday, blasting his way directly into Round 3 with the joint highest single ride score and second highest heat tally in thumping one to two metre beachbreak waves at Barra de Tijuca in Brazil. Rejuvenated after spending his summer break back in Southern Africa, Smith has been one of the form surfers on the 2013 ASP World Championship Tour (WCT) and came into the third stop ranked No. 7 in the world after reaching the semi-finals in the last event at Bells Beach Australia and finishing 13th at the season opener on the Gold Coast. Trailing after an outstanding tube ride by Adam Melling that earned the Australian 9.57 out of 10, Smith fought his way back with a 7.17, took the lead by adding a 5.73 and then sealed the heat victory with a deep tube and a spectacular close-out re-entry that earned him 9.77 and a heat total of 16.94 out of 20. Travis Logie was not as fortunate in his Round 1 match-up, finding wave selection difficult in the challenging conditions and finishing second behind WCT rookie Glenn Hall (IRL). Logie faces fellow WCT veteran Kieren Perrow (AUS) in Round 2 when men’s competition resumes. Others amongst the world’s top 34 surfers to star on Day 1 included Brazilian prodigy Gabriel Medina, 19, who threaded his way through several hollow barrels on his backhand to record the day’s highest heat total of 18.0, fellow Brazilian and Bells Beach winner Adriano de Souza and the perennial top contenders in reigning ASP World Champion Joel Parkinson (AUS), 11-time world champ Kelly Slater (USA) and two-time world champ Mick Fanning (AUS), all of whom convincingly won their encounters. The Colgate Plax Girls Rio Pro, stop No. 5 of 7 on 2013 ASP Women’s WCT, got underway in smaller one metre waves and clean conditions at Barra de Tijuca this morning. South African rookie Bianca Buitendag (George), currently ranked No. 9 after a fifth, two ninths and a 13th place result in her first four events at this level, finished third in the first heat of the day. Buitendag will contest her Round 2 heat later today as the organisers run as far as they can through the women’s draw. All six members of the SA surfing team will be in action today, Day 5 of the 2013 Reef ISA World Surfing Games at Santa Catalina in Panama, as the four men contest their respective qualifying stream Round 3 heats while the two women face do-or-die encounters in repercharge Round 2. After a day off yesterday (Wednesday) when three rounds of men’s repercharge rounds were completed, Shaun Joubert, Mikey February, Davey Brand and David van Zyl will be primed to maintain their positions in the upper tier of the double-elimination format and take another step towards the Grand Final and one of the gold, silver, bronze and copper medals on offer. Tanika Hoffman and Faye Zoetmulder will be just as determined for a successful start to their arduous passage through the women’s repercharge rounds where finishing lower than second in any heat will mean elimination from the event. Yesterday’s action saw 30% of the men who started the event eliminated, leaving South Africa and Peru heading the provisional points standings as the only countries with all six team members still in contention for individual titles. Brazil, the 2011 team runners up, along with Costa Rica and Venezuela have each had one team member ousted from the event while defending team champions Australia, Mexico, Ecuador, Mexico, Argentina, Chile, hosts Panama, Puerto Rico and Japan have all ‘lost’ two members. The swell remains around 0.5 to one metre in Panama and with an extremely low Spring tide at 9.26am local time, the start of today’s surfing action is likely to be delayed until around noon (7pm SA time). All the action can be followed live via webcast at www.isawsg.com Each day’s webcast begins with the Morning Show at 2.40pm (SA time) followed by competition starting when the conditions are suitable. Challenging conditions including an extreme low tide and tiny waves forced organisers of the 2013 Reef ISA World Surfing Games to delay the start of Day 3’s action at Santa Catalina in Panama yesterday (Tuesday). When the contest did get underway, Team SA’s Tanika Hoffman and Fay Zoetmulder struggled to find waves with any scoring potential and even resorted to riding left breaking waves at the predominantly right-breaking reef, before finished fourth and third respectively in their Round 2 heats. This resulted in the pair dropping out of the qualifying stream and into the repercharge rounds in the double-elimination format. In a low-scoring encounter that saw just 1.4 points separating first place from fourth, Hoffman and Australian Dimity Stoyle both had scored less than one point with three minutes remaining when the best set waves of the heat rolled in. Stoyle earned 7.17 on the first wave to leapfrog into the lead and leave Hoffman needing 6.83 for second place. The 20 year-old from Clifton came up just short on the next wave with a 6.0 that left her requiring 1.50 points. But the ocean went flat and Nataly Bernold (Switzerland) hung onto second place with Valeria Sole (Peru) joining Hoffman in the repercharge rounds. Zoetmulder (Cape St Francis) also came agonizingly close to securing second place. After Australia’s Codie Klein had jumped out into an unassailable lead by posting scores of 5.83 and a near perfect 9.50 to combo her three opponents in the first six minutes, Zoetmulder fought her way back into second spot, but was overtaken by Maria Lucia Cosoleto (Argentina) in the last minute. Both SA girls now face a gruelling schedule of seven heats in the next four days to reach the Women’s Grand Final and earn a medal. Anything other than first or second place in those heats will see them eliminated from the event. Team SA remains one of 14 countries who still have all six of their competitors still in contention after three days. That is expected to change significantly today when 18 Men’s repercharge heats will be run. Today’s action at the Reef ISA World Surfing Games comprises Men’s repercharge Rounds 1, 2 and 3. As all four South African men are safely through to Round 3 in the qualifying stream, Team SA has a day off from competition and our next report from the event will be on Friday 10 May. All the action can be followed live via webcast at www.isawsg.com Each day’s webcast begins with the Morning Show at 2.40pm (SA time) followed by surfing action starting at 3pm.